Kelp seaweed capsules are a completely natural, organic product and a source of over 70 vitamins and minerals, with nothing added. 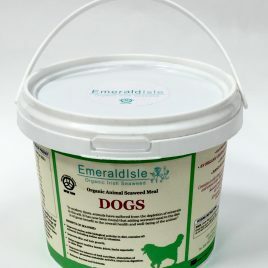 We treat our seaweed in an entirely natural way, hand harvested, hand dried and chopped. No chemicals or any other substance is used in production. No microwave, or any harmful process is undertake. Kelp seaweed capsules are a natural source of Iodine which supports healthy thyroid function and is good for general health and skin condition. 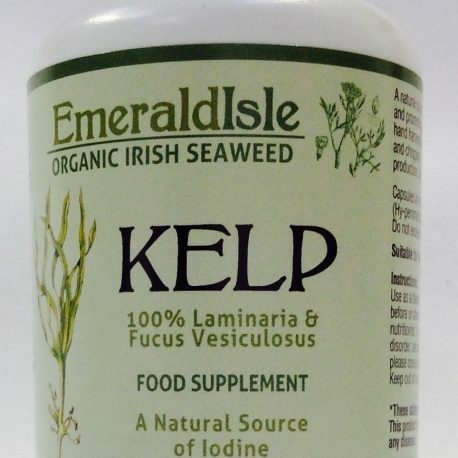 Emerald Isle Seaweed Organic Kelp Tablet (500mg) 90 capsules. 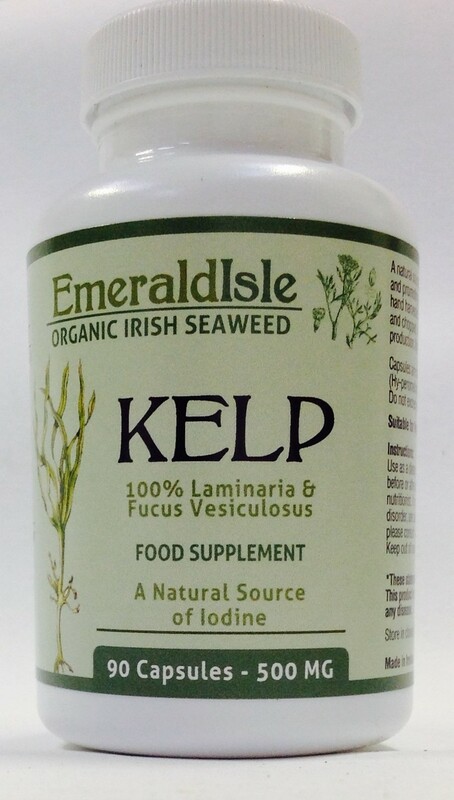 Total of 45 grams of pure 100% kelp Laminaria and Fucus Vesiculosus in 90 capsules. Total iodine content of 735mcg in each capsule. Serving Size 1 tablet (HPMC capsule) Suitable for vegetarians. Why we should all eat seaweed, the iodine debate! The consumption of seaweeds has increased in recent years. However, their adverse and beneficial effects have scarcely been studied. 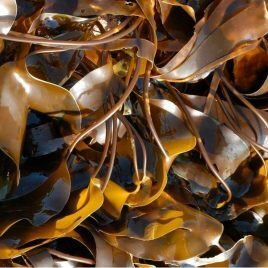 Two extracts from the brown seaweed Fucus vesiculosus containing 28.8% polyphenols or 18% polyphenols plus 0.0012% fucoxanthin have been obtained and studied to determine their toxicity in mice and rats and also their antioxidant activity. Both extracts were shown to lack any relevant toxic effects in an acute toxicity test following a 4 week daily treatment in rats. The extracts exhibited antioxidant activity in noncellular systems and in activated RAW 264.7 macrophages, as well as in ex vivo assays in plasma and erythrocytes, after the 4 week treatment in rats. 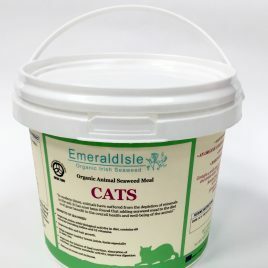 Our ex vivo results indicated that compounds from extract 2 may be more easily absorbed and that the antioxidants in their parent or metabolized form are more active. These findings support the view that the daily consumption of F. vesiculosus extract 2 (Healsea) would have potential benefits to humans. Extremely impressed with the high level of customer service provided by this seller/ family run business. The product itself was packaged very well, with 2 notes enclosed and signed and dated by the seller which I felt was a nice touch and added some personalisation to the sale. It was sent by first class post so arrived really quickly. The product itself is also of high class and is evident that it is 100% natural and definitely worth every penny! I have felt the benefits of the product quite soon, obviously with anything it sometimes requires a bit of time and bear in mind everyone’s body is different and whilst some can see benefits quicker, some can take a bit longer. This was the case for both my mother and I as we are both using these tablets. Would highly recommend product and seller. Product and service both are of very high quality and impressed with both! Will be back for more! Thank you. I’m 40 years old. Years ago in my early 20s I had a partial thyroidectomy due to hyperthyroidism. I haven’t had to take medication for it after that surgery. I’ve also suffered from iron deficiency anaemia for many years. This last year I’ve been experiencing autoimmune disorder symptoms (e.g. painful geographic tongue thing identified by my dentist) and other symptoms pointing towards a thyroid issue and I also don’t eat many foods which contain iodine such as dairy products and fish. I have also been struggling with severe acne, dry hair and skin so it does seem as if this is exactly what I need. I am due to return to the endocrinologist in about a month and a half so I want to try the natural route first to see if a lack of iodine is a, or the, cause. For the last month I had been taking kelp tablets by another major health shop brand and have noticed that my hair has been feeling much better (e.g. feeling thicker and feeling consistently softer) and my acne has been calming down so no new nasty spots. Skin feels less flaky also and I noticed my nails look healthier and stronger as they are growing in…. now on to these capsules. I stopped taking the other tablets a few days ago after reading about the fillers used to bind tablets together so I stopped taking them and searched for a more natural solution. I like the fact these capsules are pure organic kelp. The dosage is suitable as I’ve read the max one should take daily is 1000 mcg iodine, I believe. These capsules provide 737 mcg so I don’t have to fiddle about with loose bags of kelp powder. I am unable to swallow tablets so I either have to chew them or open them. I can easily open these. I just tap the top of the short bit of the capsule to make sure all the kelp is in the long side. Carefully open it and pour the contents in my mouth with some juice. I give these 5 stars. The delivery was way ahead of schedule. It’s organic. Easy to take and will hopefully make a great improvement in my health condition the longer I take them. 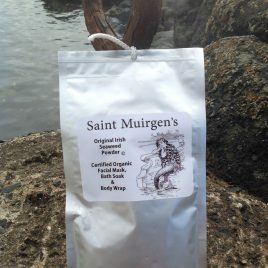 Excellent quality kelp, beautifully packaged and promptly delivered. Having had a quadruple heart bypass I monitor and record my blood pressure regularly. After taking the kelp capsules for two weeks, both my blood pressure levels dropped by 10% and remained there.My energy levels and alertness have also increased. Also my retention of fluid, due to heart tablets, has gone completely. No more swollen ankles. I have also stopped taking Lansoprazole tablets for severe heart burn. No more heartburn either. AMAZING genuine product. Many thanks.